« Alvaro Morata to Arsenal. Yes, no, maybe, what? Games are coming fast for the moment so I will type a bit faster to make sure we get this ready before the next Arsenal match. Let us have a look at the results of the weekend and what they mean for Arsenal. I’ve added the league table now, and one year ago at this same point, at the end. A great win at a ground where both Manchester teams dropped points. Another display based on technical skill and flair but also on a team that is determined to not concede any goals. Only one goal conceded in November. And that was the only game when we had to miss our BFG. Coincidence? Not for me. And by the way I have seen a little video clip of the Arsenal bench when Özil gave his assist to Flamini. And even without being a lip reader you could see Bould shout: ‘What a ball’ and then both Wenger and Bould jumping up to celebrate the Flamini goal. Indeed, what a ball…this sums Özil up for me. Arsenal is on top of the league table after 13 games with 31 points. Last season after 13 games we found ourselves in 6th place with 20 points. That is 11 points more this season than last season. Not bad. Despite an early gift-goal within seconds after kick off Southampton couldn’t hold on to the lead. At the start of the season they were impressive in their high pressing up the pitch but since they lost at Arsenal they seem a bit off the boil. Unfortunately. As for Chelsea they rely a lot on set pieces. Both their first two goals came after a set piece when their defenders moved forward and bailed them out. Mourinho is still one of the games biggest ego-trippers around. Drawing attention to himself whenever he can. Chelsea are in second place 4 points behind Arsenal with 27 points. Last season after 13 games they were in 4th place with 25 points. So now they have 2 points more than last season. Southampton drop to 7th place and has 22 points. Last season they were in 17th place and had 11 points. So they still will feel very comfortable with the way they started the season. 11 points more, just like Arsenal. Manchester City – Swansea 3-0. Another home win for Manchester City. They surely are strong at home but up to now they also struggled a lot away from home dropping too many points there. Their forward line looks capable of scoring lots of goals and they have scored most goals in the PL so far (37 goals so far) and that is 10 goals more than Arsenal who have scored the second highest number. Manchester City is in 3rd place with 25 points. Last season they were in 2nd place after 13 games and had 29 points. So despite scoring more goals they have fewer points in the table, four fewer to be exact. Liverpool got a double blow. Losing Sturridge was the first blow but losing to Hull might have also a big impact. Now I must say from seeing the highlights that one could say that Liverpool was a bit unlucky with the goals they conceded. Not that I mind that much to be honest. But surely 2 of the goals were rather unlucky/poor to concede. A deflected shot and the last goal where Skretel managed to head a ball that was going wide past his own keeper was funny to see. Not if you are a Liverpool supporter of course. From an Arsenal point of view we can hope that Hull has had all their lucky used up in this game. Liverpool is 4th in the league and has 24 points. Last season they were 11th and had 16 points. So 8 points better than last season. A rather easy win it seems for Everton. Well not many Arsenal supporters mind a good stuffing of Stoke. Everton come to the Emirates next weekend and we have got to keep an eye on Mirallas and hope he doesn’t kick out like the madman he can be at the valuable legs of our players. The question when Everton lost Fellaini was how they would cope without him. So with a 5th place and 24 points they seem to be doing rather well. Last season they were also in 5th place but with only 21 points. So losing him didn’t really cost them up to now. Another win for Newcastle who are having a good spell for the moment. No Remy on the score sheet for this match, but yet again the French connection did the job for Pa rdew and Newcastle. It is rather funny that it is Pardew who is leading the best scoring French team. By this I mean the team where Frenchman scored most goals. He does better than most French teams in Ligue 1. Newcastle are currently 6th with 23 points. Last season they were 14th with 14 points. So 9 points better or mieux as the French would say. The perfect result for Arsenal I would think. We surely don’t like to see either of them win a match. So a draw is something we can live with. Well I can. As we won we opened up an even bigger gap towards both teams. Dean’s love affair with Tottenham…or was it with Arry’s Dog has seemingly ended after Arry left. Manchester United is in 8th place in the league with 22 points. Last season they were top of the league with 30 points. So 8 points less than last season. Their next match is against Everton so another draw would be nice. As for Tottenham they are in 9th place with 21 points. Last season after 13 games they were in 7th place and had 1 point less. So they are doing relatively speaking even better than last season when you look at the points won. Let me stop this Untold weekend review with pointing at the team in 10th place: Hull. Our next opponent. Seven points above the first relegation place with 17 points. I think they would have taken that at the start of the season any day. But the same can be said about Arsenal. Wouldn’t we have taken this position and this number of points at the start of the season in a heartbeat? Let us keep it rolling as it is. And to round this up I would like to point at the injury league table, where for every player that has been out for one week you get one point. Arsenal are also top of the injury league. We have already lost 119 playing weeks or points. The team in second place is WBA with 92 points. Chelsea only has 44 points in the injury league. So you could say that Arsenal had to deal with 3 times as many injuries as Chelsea so far this season. And Arsenal also had to deal with more than the double of injuries compared to Manchester City. You can check the full injury league table over here if you want. And yet here we are top of both league tables… amazing isn’t it? Amazing to see WBA, Swansea, Fulham and West Ham in the top ten last year – and the fact it had to be extended to 11 to squeeze Liverpool in. 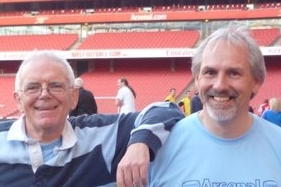 Interestingly on the history site today there is a piece on how Arsenal went from 15th to 5th in two months during 2011. That piece has the league tables for the same season, just two months apart. We were written off as contenders even though we were only 10 points off the leaders last year, yet most of the press still think Utd are title contenders for this year. No wonder AVB said what he said abt other managers and teams treated differently to him – when his team only has 1 point less than this years title contenders MUtd. I didnt know 1 point is the difference between title contenders and finishing in europa league as per the press. The injury league table is a surprise. I would have thought that we had become better at voiding injuries for our key players. Apparently, we haven’t. I would have thought that we have one of the best investments in terms of facilities and personnel on players’ injury care; apparently it isn’t availing much. I would have thought that EPL has become more protective of players, and less aggressive to Arsenal in particular, apparently, it hasn’t. Can Untold please lead the way in digging deeper on this matter for us? The fact that the refs allow our players to be kicked and kicked by the opposition and not penalise them is a majour injury problem for us. Jack Wilshire is supposed to have ‘weak’ ankles and thus regularly needs medical treatment for them. These supposedly weak ankles would be normal ankles if the refs observed the rules and penailsed the kickers. Could you imagine the refs allowing Rooney to be kicked off the park as Wilshire regularly is? I think not. Rooney seems to have inherited Ferguson’s final testament to the referees’ union to be the “Protected One”. Last season Arsenal finished 16 points behind champions Man Utd. As your league comparison shows, Arsenal are now 11 points better off than at the same stage last season and Man Utd are now 8 points worse. Thats a huge 19 point difference already. This is very on point! Interesting article indeed based on facts and figures. Even if Arsenal win the league and ucl double haters will still hate. For Michael Owen to say we cannot be in top 4, it is absolutely ridiculous. I’m sorry Tasos, but that is still only 9 points ahead of Manu by my maths but may we increase it by as much as possible. So the difference is still 9 points however one looks at it, or am i missing something? I hope this does not bode bad news for us on Wed. Sagna is going to be out and Jenkinson is playing. So this is going to have to be one of those games where they beat the stats. It’s a must win game, no ifs no buts. Most important of all is that the team and, I believe, by extension, the fans, with some AAA exceptions, have a great deal of confidence right now. I can’t predict the scores of any of the games but I believe that the team will play well. BTW, -17C, 40 cm of snow over the last 24 hours where I am. Enjoy your green grass. Have no fear about Jenkinson. He will eventually be a great successor to Sagna and an Arsenal legend. At this point last season, I never looked at the table! Honestly.